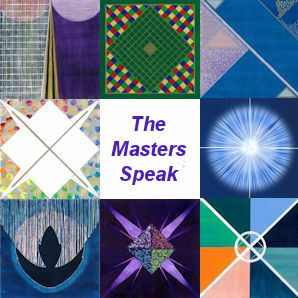 The Ascended Masters rarely talk in verbose ways, preferring to deliver succinct teachings. Some of those we have received at the Ascended Masters portal are here. "Believing in ascension doesn't make you advanced." "Knowing the story doesn't make you the Storyteller". "You are better than anyone you pretend to be." "Silence is a place... its that place, where a drop of water is suspended before it falls, like that drop of water you see. Its the place between the in breath and the out breath. And in this silence, there is no thought, no sound. That is the place you strive to achieve in meditation." Concentrate on the breath, at that point when your lungs are full and before you exhale, feel and experience the place between breaths. Now hold that place as you exhale, hold that place between breaths, inhale still holding that place. Keep holding the place between breaths as you slowly breath in and out renewing your place in the silence.